Authored by: Susan Burch, Ph.D.; Foreword by Paul K. Longmore, Ph.D.
Like race and gender, disability has recently become a critical field of study in examining our nation’s heritage. Sparked by the disability rights movement of the late 20th century, disability history both expands and challenges the traditional American narrative of self-reliance, individualism, and opportunity and yields new understandings of such bedrock values as community, family, and citizenship. From the asylum movement of the 19th century and the cover-up of Franklin Roosevelt's paralysis during his presidency to the landmark Americans with Disabilities Act of 1990 (and amendment of 2008) and the impact of every war on veterans’ physical and mental health, the experience of disability—and society’s reaction to it—has changed markedly throughout American history. The definitions of disability have also changed from era to era, revealing competing views, approaches, and attitudes. 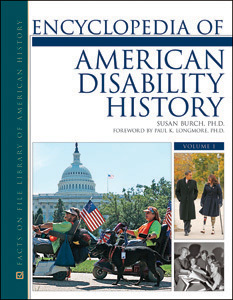 Encyclopedia of American Disability History is the first encyclopedia to focus on this important topic in U.S. history. By examining the issues, events, people, activism, laws, personal experiences, and social ramifications of disability throughout American history, this comprehensive three-volume reference provides a new and broader, more inclusive approach to our nation’s past. More than 350 historians, scholars, and experts contributed to the 750-plus articles in this impressive work. Arranged alphabetically, each signed article includes cross-references to related entries and suggestions for further reading. Ideal for the high school and college curriculum, this accessible encyclopedia also includes a comprehensive chronology and dozens of original documents, as well as an extensive bibliography. "Offering a unique perspective, Encyclopedia of American Disability History is highly recommended for academic and large public libraries." "...a fascinating encyclopedia set...valuable...an important addition to any public or academic library collection and is highly recommended." "...an excellent resource on the history of disability in the US...Highly recommended." "Written at a reading level appropriate to the high school researcher, this work is equally valuable to the college student seeking to learn more about disabilities, American history, or persons who have been involved with disabilities in America."